Microwave ovens have come a long way from the most basic models and designs that simply heat up and defrost food. However, in the recent times, there are still some great possibilities of getting hold of the so-called solo ovens. The models of the present times combine microwaving with oven and frill. There are many models that come with in-built recipes and menus while there are others that do things such as steam cooking. You will even get varieties with two-step functionalities like cook and defrost. In the microwave oven category, there are basically two trends that you need to look out for and they are crispier plates and flatbed designs in place of the turntables. You can make microwaving a breeze by going for the spacious Panasonic Genius Sensor Microwave Oven. This is a top pick for the best microwave ovens for kitchen offers a 2.2 cubic feet of internal space along with 1250 watts of power. It comes with some of the best features that make it stand out among the other microwave ovens available in the market. It has a stainless steel sleek appearance and features 16 sensors or cook settings. The oven comes with an in-built inverter that delivers consistent heating power that does not leave food unevenly heated or rubbery. For the ones who frequently turn to microwave ovens for cooking, steaming and defrosting everything from vegetables to meat, this model would serve as the best choice. The 1250 watts of power offered by this model can heat drinks and food in a very short span of time. The item has been successful in earning a good amount of praise for the powerful defrosting potential that it possesses. This makes it easier for the users to get meals done in a hurry. The controls and the display are easy to use. In addition to this, the button for opening the door makes for smooth operation. If you can easily make up with less space but cannot make any compromises with the power offered by a microwave oven then the Samsung Countertop Microwave Oven is the right product for you. This product comes with ceramic enamel interiors that can be cleaned very easily and thus it is considered one of the best microwave ovens for kitchen. 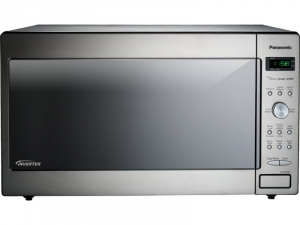 At the very first glance, you will find the Samsung microwave oven sleek and stylish. It features a smoked door in black with a handle made of stainless steel. The control panel of this item combines metal dial and digital controls. The ceramic enamel interiors have been specifically designed to wipe clean easily while resisting oil, grease and scratches. The LED display of this model makes it very easy for the users to keep a track of the remaining cook time. There is also an Eco mode that allows the users the turn off the digital display to preserve energy instead of unplugging the entire unit. This is one of the most exclusive features that make it one of the best microwave ovens for kitchen presently available in the market. With 1000 watts power and an average capacity of 1.1 cubic feet. This model from Samsung is probably a good choice for people who are in the look out of easy to clean microwave ovens. For different ways of cooking in just one appliance, try looking for microwave ovens with convention ability. In this regard, the Toshiba Microwave Oven with Convection can serve you in the best way possible. This is a convection microwave that is a champ at traditional microwave oven functions along with baking and roasting. It offers 1.5 cubic feet of space that is sufficiently large for accommodating full size dinner plates and an entire pizza or chicken. There is even a grill rack that can be used for some of the best grilled dishes. It offers 1000 watts of power that is sufficient for reheating vegetables and meats. You will surely fall in love with this convention microwave oven for the versatility that it offers. Nevertheless, it serves to be one of the best choices for individuals who are in the look out of microwave ovens that can serve to be perfect for preparing single pizza or smaller dishes. The Toshiba Microwave Oven is one of the best microwave ovens for kitchen for all those homemakers who want countertop microwave ovens that have the ability of handling all basic tasks while balancing counter area with a spacious capacity at the same time. Available in silver and black stainless steel, this model from Toshiba comes with an internal capacity of around .2 cubic feet and measures more than 20 inches in width and 17 inches in length. It offers 11000 watts of power that can easily be adjusted using a total of 10 power settings to match different cooking requirements. This unit also comes equipped with two defrost and sensor cooking settings. This microwave oven from Toshiba has earned a good reputation for being reliable and easy to use. 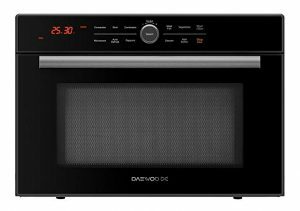 If you are a college student in the look out of a stylish and functional way of heating leftover ramen and pizza then the Daewoo Retro Microwave Oven is the best bet for you. This is probably the right productespecially for individuals who want to heat up dorm room staples in the easiest way possible. It is a top pick in the category of the best microwave ovens for kitchen, thanks to its nifty appearance, efficient functionality and compact form. Available in three distinct colors, this oven from Daewoo is eye-catching. The colors are white, red and turquoise. It even features a digital control setting that gives users the flexibility of choosing their functions and setting the power levels. The retro-inspired knob of this model is something that catches the attention of the onlookers. There is a turntable that is 10 inches long within the microwave and it is perfect for single servings. There is a lot of space for college students to heat up their snacks or reheat their beverages while practicing long sessions of study. Yet another convenient aspect of using this product is that it comes powered down in between uses. This practically means that you would not have to combat the glow of the digital display while trying to sleep. This will also save a lot of energy. Superb cooking potential and elegance are the features that you will get with the Danby Designer Microwave Oven. This is an economical and a practical unit that also serves to be highly stylish as it is available in stainless steel and black finish. It is only because of its design and its features that the model has made it to the list of the best microwave ovens for kitchen. It is also important to note that it perfectly matches the décor of almost any room in a house. This is a highly dependable home appliance featuring an interior space of 0.7 cubic feet making it perfect for offices, lunchrooms, cottages and kitchens. It offers 700 watts of power and comes with 10 varied settings. The one-touch cooking function of this model is something that has caught attention. The oven features a total of six electronic controls that can be read, monitored and programmed very easily, thanks to the bright LED clock apparatus and timer. All in all, it can be said that this is a trendy microwave oven with simple usage and stylish appearance. 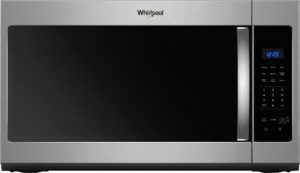 The Whirlpool Mountable or Over the Range Microwave Oven will offer you the convenience of faster reheating without using kitchen counterpace. If you are in the look out of the best over the range microwave ovens then this would be the right shot for you.Over the range ovens are available in varied sizes with majority of them providing a minimum of one cubic feet space. However, the model from Whirlpool is a little different.It offers 1.9 cubic feet of interior space that serves to be perfect for microwaving plates and dishes of all sizes and shapes. You will also get this product in different colors and finishes like black, biscuit and stainless steel. This way the oven coordinates very well with different home décor or kitchen décor themes. The 300 CFM ventilation mechanism of this microwave oven is an exclusive feature not found in many other models presently available in the market. This feature allows the oven to keep smoke and odors from the cook top under complete control. The unit also features high, medium and low speed fans. It offers 1000 watts of power and also possesses the ability of sensor cooking for ensuring that food gets reheated in the right way. The ease of use and performance of this model will surely impress you. Out of all the best microwave ovens for kitchen, this one from Whirlpool will surely catch your attention because of its compact size and shape. It is one of the mightiest and smallest microwave ovens presently available in the market. It is the best choice for small kitchens, apartments, offices and even semi-trucks and RVs. You can easily mistake it for a small television because of its compact size and curved back. You can easily tuck it in a small cabinet or corner. There is a large turntable inside this product that can accommodate full-size dinner plates very easily. it is an ultra-compact microwave oven that offers a lot of power and even matches the level of performance offered by large microwaves available in the market. If it is the best budget microwave oven that you are looking for then the one from Hamilton Beach would be the right choice for you.Available within an affordable range, this model offers great performance and has the capability of fitting an average 10.5 inch plate easily. there are a total of 6 pre-set controls available on this unit for cooking pizza, popcorn and frozen vegetables easily. This microwave oven from Farberware is also a good bet for money because it renders top quality within a price that one can easily afford. it has a compact body made of stainless steel and perfectly matches the interiors of almost any kitchen. It is probably one of the best microwave ovens for kitchen because of its exclusive features and high performance. If you are looking for advanced models within an affordable range then the list of the best microwave ovens for kitchen provided above will help you make a great choice.